Thanks to the Shuswap residents who applied to become a Community Representative on the Shuswap Watershed Council. The date for applications has now passed, but stay tuned - we'll announce the new reps soon! The following describes the selection process. Up to three Community Representative positions are available on the SWC membership, for up to three-year terms commencing in April 2019. 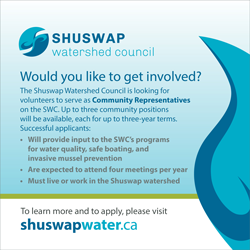 As a Community Representative on the SWC, you will work with other Council members (see the Council membership) to provide input on and oversight of the delivery of the SWC’s programs for water quality, safe boating and recreation and invasive mussels prevention. Can attend quarterly meetings, without remuneration (compensation for travel is provided). See the 2019 SWC meeting schedule. Statement of Principles – guides the SWC members in their work.